More than one hit-and-run crash occurs every minute on U.S. roads, according to new research from the AAA Foundation for Traffic Safety. These crashes resulted in 2,049 deaths in 2016 - the highest number on record and a 60 percent increase since 2009. With the number of hit-and-run crashes on the rise, AAA is calling for drivers to be alert on the road in order to avoid a deadly crash and always remain on the scene if a crash occurs. 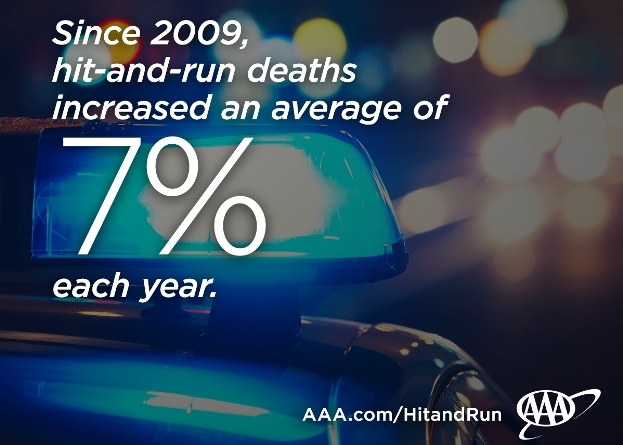 • An average of 682,000 hit-and-run crashes occurred each year since 2006. • Nearly 65 percent of people killed in hit-and-run crashes were pedestrians or bicyclists. • Hit-and-run deaths in the U.S. have increased an average of 7.2 percent each year since 2009. • Per capita, New Mexico, Louisiana and Florida have the highest rate of fatal hit-and-run crashes while New Hampshire, Maine and Minnesota have the lowest rates. The AAA Foundation report found that most victims of fatal hit-and-run crashes are pedestrians or bicyclists. Over the past 10 years, nearly 20 percent of all pedestrian deaths were caused by hit-and-run crashes, compared to just one percent of all driver fatalities in that same time period. • Be aware: Pedestrians may act unpredictably and can walk into the path of travel at any point. • Be cautious: Look out for small children and be alert to areas where there are likely to be more pedestrians. These include school zones, playgrounds, bus stops and intersections. • Be patient: When trying to pass a pedestrian or cyclist, give plenty of space and keep them in your line of sight. • Be vigilant: Drivers should always yield to pedestrians, even if they walk into the road from an area other than a crosswalk. Currently, every state has laws that make it illegal for a driver involved in a crash to flee the scene. State penalties vary depending on the type of crash (i.e. property damage, injury, serious injury or a fatality). If found guilty, drivers can face large fines, lose their license or spend time in prison. AAA encourages drivers to educate themselves about specific hit-and-run laws in their state and remain alert on the road to prevent crashes from occurring. In California, drivers who leave the scene of a crash involving property damage could face six months in jail and/or a $1,000 fine. If a driver leaves the scene of a crash involving an injury or death they could face up to four years in jail and/or up to a $10,000 fine. 1. Assist the injured- Check for injured people and call 911. 2. Be visible- Make sure that the scene is visible to approaching drivers. If possible, move vehicles out of the path of traffic, and use hazard flashers, flares, and reflective triangles. Find a safe place to remain until emergency services arrive, if needed. 3. Communicate- Call the police and file a report. If the police do not come to the scene, you can file a report by visiting a local police department or your automobile insurance agency.